Chipotle cut off a major pork supplier so it won't be able to serve pork at some restaurants. So reads a sign posted in a Chipotle restaurant in New York City. The Mexican-style fast food chain has temporarily cut loose one of its pork suppliers for not meeting its requirements, depriving some of the restaurants of carnitas. "We found a pork supplier that was not meeting our standards, so we have suspended our purchases from this supplier," said Chipotle Mexican Grill (CMG) spokesman Chris Arnold, in an email to CNNMoney. "We cannot get enough pork that meets our responsibly raised standard for all our restaurants, and we will not be able to serve carnitas in some locations," he said. Arnold said that Chipotle requires that its pork "comes from pigs that are raised with outdoor access or in deeply bedded pens, and without the use of antibiotics." 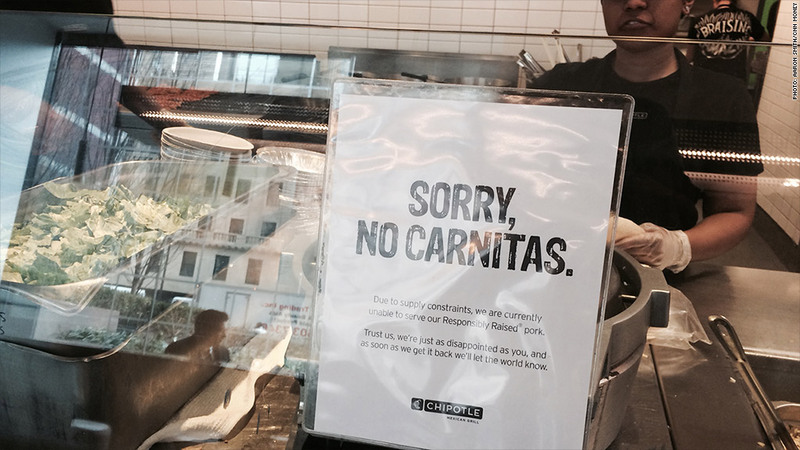 A worker at a carnitas-free Chipotle in New York City said her restaurant was notified about the pork shortage at the beginning of the week, and there won't be any carnitas there "for a while." Chipotle did not identify which of its suppliers had been suspended. A spokesperson for Niman Ranch - Chipotle's biggest and oldest pork supplier - insisted it was not them. "In fact, we have been working with Chipotle this week to help get them more product to fill the void from the suspended vendor," said Jeff Tripician, executive vice president of Niman Ranch, which has 700 family farms.